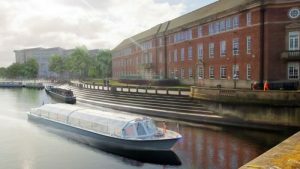 Derby is to be reconnected to its river in new plans being led by the Derby and Sandiacre Canal Trust . The plans are the first stage of a bigger project to develop the waterway into a major tourist attraction. Exeter Bridge will see the first landing stage to be installed from which an electrically powered narrow boat will cruise a 2.5km route to the island near Darley Mills. The first cruises are to be expected in summer 2019.